Do you like Thai food? Have you always wanted to learn more about Thai Town? If so, we’d love for you to join us this Saturday, March 7th, around 11am for a walking food tour of LA’s Thai Town led by celebrity Chef Jet Tila! This LA native and culinary storyteller was appointed the official Thai Culinary Ambassador to the United States by the Royal Thai Government and is a regular judge on the popular TV show Cutthroat Kitchen. In collaboration with and in support of TABA, Chef Jet is offering a significantly reduced rate of $60/person for his food tour, which is a steal, since Chef Jet’s tours are normally offered at $125/person. 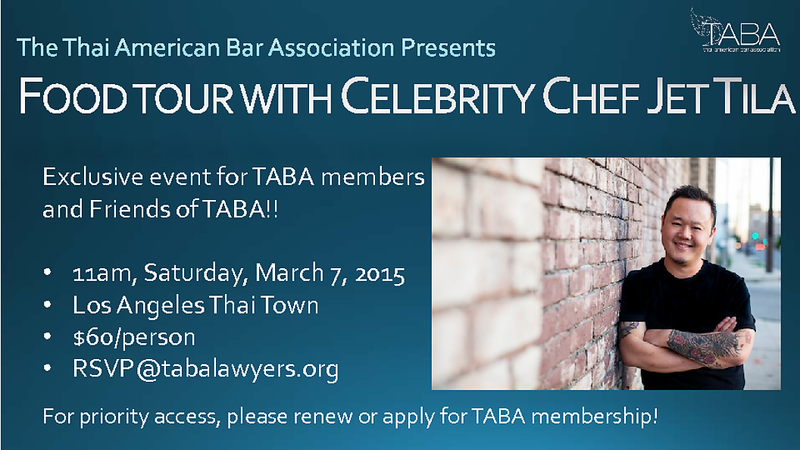 RSVP to RSVP(at)tabalawyers(dot)org by March 4, 2015. Space permitting, we will confirm your spot by March 5, 2015. Friends of TABA are welcomed and encouraged to attend this event! But priority is being given to current TABA members. So if you haven’t already, please become a TABA member or renew your membership for this year at http://www.tabalawyers.org/membership .